I was part of the WORLD VIEWS Studio program at the World Trade Center (LMCC), for three and a half months along with other 14 artists, we shared 1000 s/f on the 92nd floor of tower 1. On September 10th like any other day I set up my camera and recorded in time lapse images from the harbor , these images were going to be part of an interactive video installation I was working at the time (A_Maze). After the tragic events of the following morning, where artist Michael Richards lost his life, I decided to create this document in his memory. 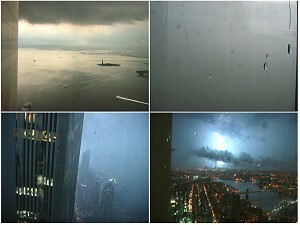 The film is five minutes long but the footage was recorded for almost seven hours it depicts an unusual thunderstorm from what it would be the last day of the WTC.